Embedding widgets such as check boxes, progress bars, etc. With the power and flexibility of a Gtk.TreeView comes complexity. It is often difficult for beginner developers to be able to utilize it correctly due to the number of methods which are required. Each Gtk.TreeView has an associated Gtk.TreeModel, which contains the data displayed by the TreeView. Each Gtk.TreeModel can be used by more than one Gtk.TreeView. For instance, this allows the same underlying data to be displayed and edited in 2 different ways at the same time. Or the 2 Views might display different columns from the same Model data, in the same way that 2 SQL queries (or “views”) might show different fields from the same database table. Although you can theoretically implement your own Model, you will normally use either the Gtk.ListStore or Gtk.TreeStore model classes. Gtk.ListStore contains simple rows of data, and each row has no children, whereas Gtk.TreeStore contains rows of data, and each row may have child rows. When constructing a model you have to specify the data types for each column the model holds. This creates a list store with three columns, two string columns, and a float column. Adding data to the model is done using Gtk.ListStore.append() or Gtk.TreeStore.append(), depending upon which sort of model was created. Both methods return a Gtk.TreeIter instance, which points to the location of the newly inserted row. You can retrieve a Gtk.TreeIter by calling Gtk.TreeModel.get_iter(). Once data has been inserted, you can retrieve or modify data using the tree iter and column index. As with Python’s built-in list object you can use len() to get the number of rows and use slices to retrieve or set values. Iterating over all rows of a tree model is very simple as well. Keep in mind, that if you use Gtk.TreeStore, the above code will only iterate over the rows of the top level, but not the children of the nodes. To iterate over all rows and its children, use the print_tree_store function. Apart from accessing values stored in a Gtk.TreeModel with the list-like method mentioned above, it is also possible to either use Gtk.TreeIter or Gtk.TreePath instances. Both reference a particular row in a tree model. One can convert a path to an iterator by calling Gtk.TreeModel.get_iter(). As Gtk.ListStore contains only one level, i.e. nodes do not have any child nodes, a path is essentially the index of the row you want to access. In the case of Gtk.TreeStore, a path is a list of indexes or a string. The string form is a list of numbers separated by a colon. Each number refers to the offset at that level. Thus, the path “0” refers to the root node and the path “2:4” refers to the fifth child of the third node. Instances of Gtk.TreePath can be accessed like lists, i.e. len(treepath) returns the depth of the item treepath is pointing to, and treepath[i] returns the child’s index on the i-th level. While there are several different models to choose from, there is only one view widget to deal with. It works with either the list or the tree store. Setting up a Gtk.TreeView is not a difficult matter. It needs a Gtk.TreeModel to know where to retrieve its data from, either by passing it to the Gtk.TreeView constructor, or by calling Gtk.TreeView.set_model(). Once the Gtk.TreeView widget has a model, it will need to know how to display the model. It does this with columns and cell renderers. Cell renderers are used to draw the data in the tree model in a way. There are a number of cell renderers that come with GTK+, for instance Gtk.CellRendererText, Gtk.CellRendererPixbuf and Gtk.CellRendererToggle. In addition, it is relatively easy to write a custom renderer yourself. 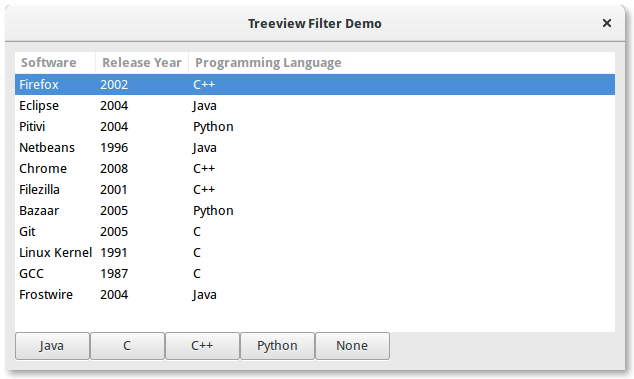 A Gtk.TreeViewColumn is the object that Gtk.TreeView uses to organize the vertical columns in the tree view. It needs to know the name of the column to label for the user, what type of cell renderer to use, and which piece of data to retrieve from the model for a given row. To render more than one model column in a view column, you need to create a Gtk.TreeViewColumn instance and use Gtk.TreeViewColumn.pack_start() to add the model columns to it. Most applications will need to not only deal with displaying data, but also receiving input events from users. To do this, simply get a reference to a selection object and connect to the “changed” signal. You can control what selections are allowed by calling Gtk.TreeSelection.set_mode(). Gtk.TreeSelection.get_selected() does not work if the selection mode is set to Gtk.SelectionMode.MULTIPLE, use Gtk.TreeSelection.get_selected_rows() instead. Sorting is an important feature for tree views and is supported by the standard tree models (Gtk.TreeStore and Gtk.ListStore), which implement the Gtk.TreeSortable interface. A column of a Gtk.TreeView can easily made sortable with a call to Gtk.TreeViewColumn.set_sort_column_id(). Afterwards the column can be sorted by clicking on its header. First we need a simple Gtk.TreeView and a Gtk.ListStore as a model. The next step is to enable sorting. Note that the column_id (0 in the example) refers to the column of the model and not to the TreeView’s column. First of all a comparison function is needed. This function gets two rows and has to return a negative integer if the first one should come before the second one, zero if they are equal and a positive integer if the second one should come before the second one. Then the sort function has to be set by Gtk.TreeSortable.set_sort_func(). Unlike sorting, filtering is not handled by the two models we previously saw, but by the Gtk.TreeModelFilter class. This class, like Gtk.TreeStore and Gtk.ListStore, is a Gtk.TreeModel. It acts as a layer between the “real” model (a Gtk.TreeStore or a Gtk.ListStore), hiding some elements to the view. In practice, it supplies the Gtk.TreeView with a subset of the underlying model. Instances of Gtk.TreeModelFilter can be stacked one onto another, to use multiple filters on the same model (in the same way you’d use “AND” clauses in a SQL request). They can also be chained with Gtk.TreeModelSort instances. You can create a new instance of a Gtk.TreeModelFilter and give it a model to filter, but the easiest way is to spawn it directly from the filtered model, using the Gtk.TreeModel.filter_new() method. Let’s look at a full example which uses the whole Gtk.ListStore - Gtk.TreeModelFilter - Gtk.TreeModelFilter - Gtk.TreeView stack. """Tests if the language in the row is the one in the filter"""
"""Called on any of the button clicks"""
© Copyright GNU Free Documentation License 1.3. Revision 0f23aed8.